K.I.S.S. 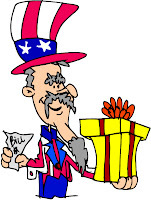 Crop-n-Shop Scrapbook Events: What is Uncle Sam getting you? What is Uncle Sam getting you? You've worked hard all year, paid your taxes and now it's time to collect your tax refund! Why not let Uncle Sam guarantee you won't have to miss another K.I.S.S. Kit or K.I.S.S. Crop again? He can do that!! Use your refund to buy a Tax Certificate then you won't ever have to miss another K.I.S.S. Crop or K.I.S.S. Kit becuase payday hasn't arrived yet!! It's a gift certificate in $25.00 increments that you can use from time of purchase until March 2011 for any K.I.S.S. Crop or Product. You will be given a code that you then use to make your purchases. Your amount is automatically deducted from your Tax Certificate! *Not valid on K.I.S.S. Club Creations due to the automatic renewal nature of that product.